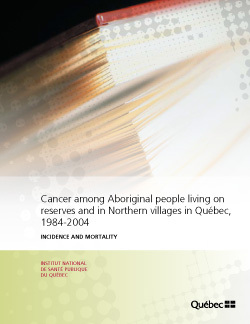 To our knowledge no data on cancer incidence and mortality among the Aboriginal population of Québec has been published. The only known reference was in a study examining the creation of a cancer registry during a specific period of the 1970s and 1980s. The study found that cancer was virtually non-existent within this population. Indeed, between 1969 and 1989 only 180 cases were reported in Nunavik, though the numbers tended to increase each year during that period. Studies in Canada and the United States suggest that the profile of Aboriginal populations is different from the general population. This small population group shows a low cancer incidence and a low cancer mortality rate. Notwithstanding these low rates, an increase in cancer (incidence and mortality) has been observed. The change in lifestyle of these populations may prompt the emergence of chronic pathologies, including cancer, which has previously been present mainly in non- Aboriginal populations. This change is of concern to public health authorities. In Québec there are 11 Aboriginal nations spread across 59 reserves and villages. These Nations are the Abenaki, Algonquin, Atikamekw, Cree, Huron-Wendats, Inuit, Malecite, Micmac, Mohawk, Innu and Naskapi. They are spread out across Québec’s 18 health regions. Cancer surveillance among these nations, starting with the Tumour File and the mortality file, is problematic as there is nothing in the databases to distinguish Aboriginals from the overall population. By using area of residence in the Tumour File and the mortality file, this study tries to identify cancer cases among Aboriginals in order to draw an actual pattern of cancer in the Aboriginal population living on reserves and in Northern villages and to determine its evolution between 1984 and 2004. This work is done within the framework of an Aboriginal cancer surveillance committee in the United States and Canada. The committee was recently established and includes Québec’s participation. The committee aims to standardize cancer surveillance among North American Aboriginals and to allow for comparisons between Aboriginal nations of the two countries, as previous studies have used different methodologies. The Aboriginal populations of Québec, who just 20 years ago were scarcely affected by cancer, today have high rates of incidence and mortality for many sites. With the low utilization of preventive measures and health services, such populations have limited means to fight this terrible illness. Moreover, Aboriginal populations are deprived on the socio-economic scale with characteristics and health problems such as obesity, alcoholism, low education, smoking and diabetes, which are also among the risk factors for cancer. Thus governmental organizations involved in the fight against cancer among Québec Aboriginals face many challenges, such as how to reduce health inequalities, increase access to health care and screening, and address poverty and sociocultural barriers. Finally, this study shows the feasibility of an approach that may be used as an alternative and systematically to monitor cancer among Aboriginals in Québec and possibly other Canadian provinces if they have similar geographic codes in their databases. Population data deserve special investigation. Population estimates are therefore necessary, be it through the addition of other sources or by using modeling to correct the under coverage, and by the addition of reserves for which there is no census data available.